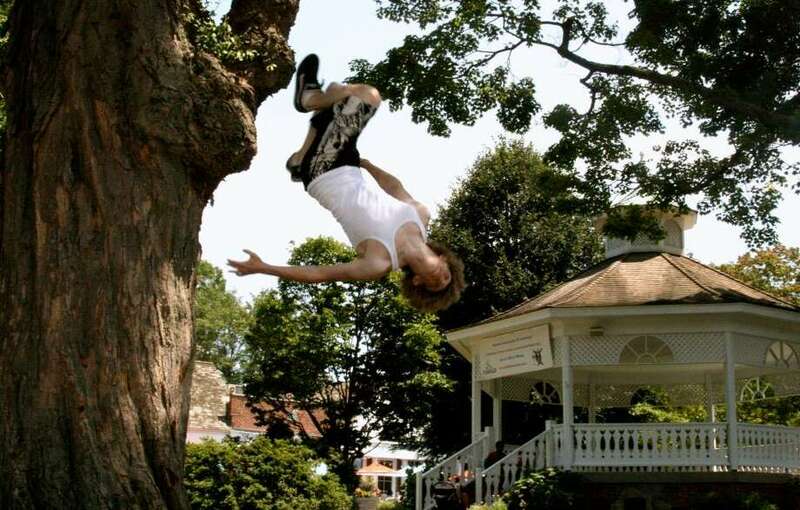 Jeff Felner, 18, a recent graduate of Fairfield Ludlowe High School, backflips off an oak tree at Sherman Green's park. Sitting in front of the Sherman Green gazebo on a sunny afternoon, people stroll through the patch of downtown green space, cool off in the shade, laze on the benches, and often enjoy a brief repast. But not everyone is so relaxed, despite this summer's sweltering temperatures. One young Fairfielder is frequently found on the green doing flips off trees, vaulting over a picnic table and performing delicate balancing stunts. As others enjoy picnic lunches or take a break from work, they stare in amazement as Jeff Felner performs his gravity-defying routines. Although Felner likes having an audience, his exertions -- a combination of free running, Parkour (adherents try to overcome any obstacle in their path), and capoeira (a martial arts/dance discipline from Brazil) -- is less about performance and more about doing something that he loves. Spinning through the air, executing tornado kicks and flipping backwards off a large tree trunk time and again simply makes him feel good, physically and spiritually. "I love doing this," Felner said. "When I'm doing flips, I get in a zone. I am so focused. The flips are the only thing that I'm thinking about. It frees me from everything else going on in life." Felner, 18, recently graduated from Fairfield Ludlowe High School and plans to attend Norwalk Community College. His goal, though, is to transfer after two years to another college to study architecture. His foray into free running and Parkour, a sport that originated in France, began about four years ago. Both are similar disciplines, however, free running is more creative and Parkour incorporates acrobatics, creative spins and flips as a means of efficiently using space. "Parkour is about how to get from point A to point B in the most efficient and quickest way," he explained. Felner also enjoys capoeira, the Brazilian martial-arts style characterized by kicks, head spins, cartwheels and hand stands, which often is done to music. He has recently been taking classes with Humberto Dias, or "Profesor Beto" as he's known to his students, at the new Sports Complex on Mill Plain Road. "I think if people want to get into shape and develop their bodies and their minds, capoeira is a great thing to do," Felner said. For Felner, the physical activities have influenced not only his view of himself, but the landscape around him as well. He admitted that since he started free running, he sees nature and architecture in a completely different way. "When I'm walking down the street now with my friends, the wall is not a wall anymore, but something that I could use to bounce off of and do a back flip," he noted. "A park bench is not a place for resting, but rather something that I could jump over." An oak tree along the Reef Road edge of Sherman Green is the site where Felner performs most of his back flips. "I should get a special plaque for that tree because it's where I did my first real back flip in public," he grinned. Felner was first introduced to free running and Parkour when his older brother, Joe, showed him a YouTube video about them. "I was really interested and thought that it was really cool," he said. He spent about three or four months researching how to do a back flip by watching numerous tutorials found on the Internet. Finally, he decided to try it. With his brother "spotting" for him, Felner ran toward a tree in his backyard, jumped up, tucked his knees and contorted his body into a ball, and attempted to flip off the large tree trunk. "Of course, I didn't land it the first time, but after a couple of weeks of trying, I eventually got the gist of it," he said. "I hit the ground a lot at first, but I got such an adrenaline rush." That rush fueled Felner's determination to master each of the stunts. "The most important part of learning how to do it is to figure out how to fall safely," he cautioned. "Sometimes, if I'm distracted while I am in the middle of flipping, and I know that I'm going to fall, it's important that I understand how to land on the ground without ending up on my face." However, that, too, has happened. Fortunately, Felner hasn't been seriously injured. He noted, too, that he appreciates "the journey of learning a new stunt" more than actually accomplishing the task. Sometimes those who participate in free running are referred to as "urban ninjas" because they jump, spin and flip off whatever walls, roofs and sidewalks are around them. On YouTube, there are numerous videos that show people performing handstands on the roofs of skyscrapers and jumping from rooftops several stories high. Although Felner abides by the town's laws and doesn't attempt dangerous tricks, such as jumping from the roofs of tall buildings, he does occasionally like to traverse Jennings Beach's Sandcastle playground by flipping, kicking and somersaulting through the area. There are, of course, no children present at the times he performs his exploits. "It's usually on a gloomy, cloudy day when they are inside," he said. Winter is typically a "depressing" time for Felner. He is grateful, though, to have Dias' new studio in Fairfield, though. For Felner, it's strange to be able to do his tricks on top of cushy gymnastic mats as opposed to the hard ground. And when he feels claustrophobic when cold weather forces him indoors, Felner admits to doing back flips off the back porch into the snow. "I get so antsy in the winter," he smiled. Before he begins his daily free running and Parkour, though, Felner is mindful of the need to warm up by doing strength and endurance exercise. His daily routine includes using free weights, pushups, situps and "L-sits." He insists that anyone, no matter how old or what size, could develop the strength and dexterity needed to perform the moves. "As you learn, you grow and get the muscle needed," he said. "It's cool when you finally do it and can say, `I can do a back flip.' That's pretty cool." Kendall Smith, 16, started doing free running with Felner a few summers ago. "It's really fun, but I wasn't very serious about it," she said. She recently jumped over a table on the green and demonstrated a powerful tornado kick, though. Griffin Cummings, 14, said that he would like to learn how to do a back flip after he saw Felner in action. "I've always wanted to do free running," he said. "I think it's pretty cool that he taught himself. It's pretty cool to watch."